The first thing I noticed when I took a look was that the installation files are exceptionally small. The complete installation package for the server component is smaller than 5 MB and is made up of a single MSI file. Such small installation packages are rare nowadays. Besides the default installation steps (such as accepting the license agreement and selecting the destination installation folder) you need to specify whether the 2X ApplicationServer will run as a single machine or if it will be used in a multiple server configuration. I will base the review on the multiple server configuration, because thatÃÂ¢Ã¢âÂ¬Ã¢âÂ¢s a good way to compare the product with other suppliers. Every server you would like to add your 2X ApplicationServer to, needs to be installed as described above. The manual, at the moment of writing, does not specify anything about unattended installation possibilities, but I already found out that the parameter TERMSRV_TYPE can be used to specify the single or multi server configuration and also successfully installs the application. Logically the default MSIEXEX parameters like INSTALLDIR can be used. All the configuration is done on one console called 2X Console. The first step is specifying the servers. The console automatically detects all servers running the Terminal Server service and with the Check agent button you can also check if the 2X software is already installed. If necessary, you can change the maximum sessions allowed on this server and the RDP port being used. You also can group servers into Terminal Services Groups. These groups can be used later on to assign applications to (when using the silo concept). 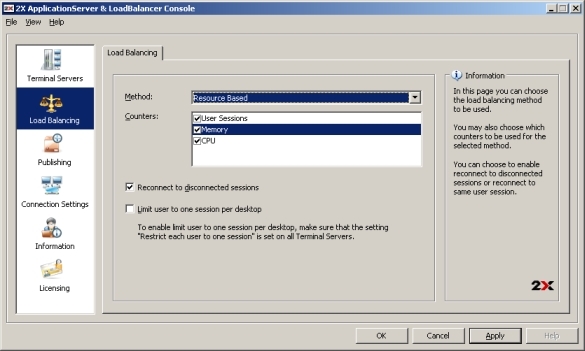 Secondly you can configure the Load Balancer. The load balancer is configurable in two modes, Round Robin and Resource Based. Round Robin is comparable with Network Load Balancing, by simply assigning the user to the server next in the list. Within Resource Based mode, on the other hand, the load balancer can be based on User load, CPU, Memory or a combination of the counters. With 2X ApplicationServer you can only perform one configuration. Just like the Citrix Load Balancer you cannot adjust a value of the counter in the total weight of the load balancer. This load balancer is based on a separate 2X product - 2X LoadBalancer. 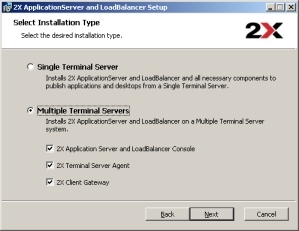 A complete review of the 2X LoadBalancer is also available on MSTerminalServices.org. Within the connection settings section you can change several settings relating to communication with the servers. For example, the default protocol ports used by the product can be changed. Authentication settings are also configured here. You can use one domain or all trusted domains. The product also allows the possibility of securing all communications via the SSL protocol and can be configured with certificates. Now the basic settings are arranged, letÃÂ¢Ã¢âÂ¬Ã¢âÂ¢s start with publishing applications. You can publish a Full Desktop or Published Applications. 2X has already predefined some applications so with two mouse clicks these applications are fully configured. One nice feature is that you can drop a shortcut or executable within the console and they are also published as a Published Application with their default settings. Within the Web Interface functionality you can also create application groups to divide applications into logical groups. 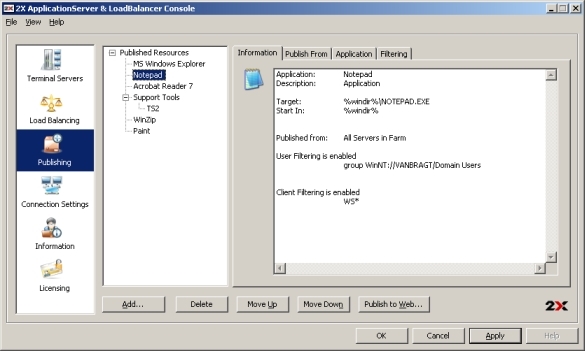 With the Publish Application wizard you can first specify which servers will host the application. The options are: all servers in the farm, a Server Group or certain specific servers. Next you can browse to/specify the application and configure the work directory, change the icon, parameters and so on. The last step is assigning the applications. The application can be assigned to three objects or a combination of these. In addition to the logical filtering based on users/groups you can also filter the application on a (range of) client IP-address(es) and (parts of the) client name. This makes it possible to deliver some applications only to specific systems or locations (if you do not allow reconnecting to disconnected sessions). The configuration is stored on the server where the 2X Console was used. Because there is no database used, the consoles on the other servers do not display the configuration of your 2X Farm (Tip: Publish the console as a Published Application on one single server). Also this server can be seen as a single point of failure because it holds the configuration of the farm. This can be solved using the cold standby solution. This option is not available in the GUI, but can be configured as mentioned on the 2X Forum. âInformationÃÂ¢Ã¢âÂ¬ÃÂ. Within this section you can see the resource capacity of all servers and the number of users connected to the servers in the 2X Farm. In the notification tab you can configure notifications via e-mail or message boxes (to a system) when the CPU, Memory, Total Sessions or Disconnected sessions counters rise above the configured value. Another management option available is the ability to create a log file containing the performance counters and activities handled by the software. For other Terminal Server management tasks you need to use (like many other suppliers) the standard Microsoft Terminal Service tools like the Terminal Services Manager. After the configuration is complete and has been replicated to all 2X Application Servers, users can start using the installed applications. 2X delivers a client for Windows, Linux and MAC clients. For Windows users there is also a Web Interface equivalent available. In this review we used the Windows client and the web interface. The installation of the client is also contained within a single MSI file which can be installed silently using MSI parameters. After the installation the application can automatically search for 2X servers. Within the configuration you can specify two servers which are used as contact points (2X calls them gateways) to point the user to the server where the application is available on the least busy server. Local resources available within the session can also be configured, like sound, disk drives, printers and serial ports, equivalent to the resources available within the RDP protocol. 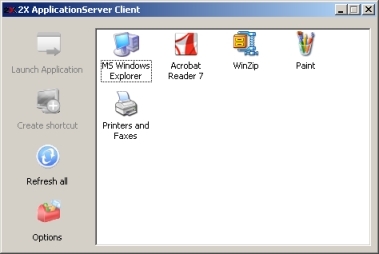 The client uses the user session on the workstation to connect to the 2X Gateway and display all available applications. Using the system tray you can create shortcuts for all applications on the desktop or create a shortcut per application by using the option within the client. It took me a while to get used to the Windows Client. When launching a Published Application the launcher (the display with the application shortcuts) is auto-hidden and only the launched application is available by default. However, this behavior can be changed within the client, so the launcher is displayed after launching the published application. Published applications work fine in seamless mode. Like most RDP-based software, if the user is using many published applications and clicks one of the published applications the others will automatically appear in front of the locally opened applications. A nice option in the client is that with the system tray icon you can quickly logoff or disconnect all sessions. The Windows application can be presented to users via the Web Interface equivalent. There is no need for additional software; you can simply make the web directory available on the web server. For Internet Information Server a little modification is necessary (a MIME type needs to registered), but it is really easy to publish the applications via the web. When using the applications via the web, the application groups are also visible. The web does all the work; showing the applications and launching the applications. When the SSL option is enabled there is no need to open any other ports on the firewall. With 2X ApplicationServer, 2X is rounding out their product portfolio. After a thin client solution and a load balancer product, 2X is now also offering published applications using MicrosoftÃÂ¢Ã¢âÂ¬Ã¢âÂ¢s RDP protocol. 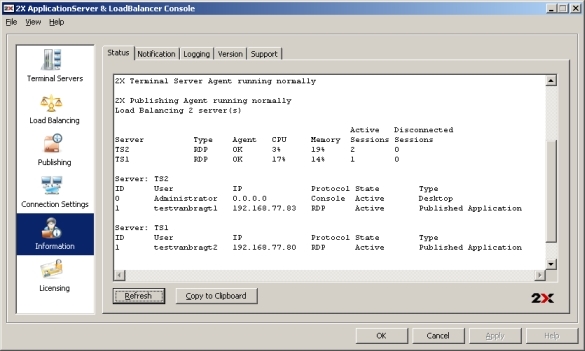 Although the product has a few minor limitations such as only allowing one load balancer to be configurable and includes just the default RDP implementation, 2X ApplicationServer is a neat product which consists of the most commonly used features (like Published Applications, Seamless Windows, Load Balancing and a SSL Gateway) in an SBC environment. The seamless Windows features work well and are comparable to Citrix. The installation and configuration is really easy and simple to follow. A recommendation would be to display the configuration in all consoles, so there is no confusion if one of the administrators connects to the wrong server. Also the support of Windows, MAC and Linux clients is a very good feature. The client includes handy options, however I was a bit surprised by the way the client window with the published applications is auto hidden when starting a Published Application.